Welcome to the Casas del Palomar (Dovecot houses), an enchanting location for you to relax and enjoy the natural surroundings. Las Casas del Palomar are handcrafted using wood, stone and traditional red kettle tiles in the artesan style. They are situated in a native oak and ash woodland where they blend beautifully with the surrounding vegetation. The interior design is unique in both its structure and its decoration. The houses offer all the comforts necessary for an enjoyable stay in the countryside. Each home also has its own private garden within the grounds of the 2 hectare estate. Even being only 50m away one house from the other, the field is so lush that the houeses seem to be isolated, but they are also suitable for groups of 14 people because they are very close to each other and both houses have large living rooms and spacious rooms. The heating is oil fired with radiators in all rooms, and there is fire in the lounge, so it's impossible to get cold in the houses. 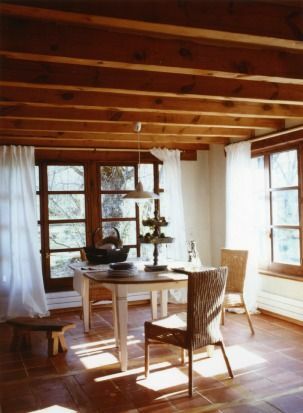 Both in winter and in summer it is easy to regulate the temperature: thermostat, south windows, curtains and shutters. No pool at home, but the public pool of La Losa, just 2 km far away is very nice and cozy, with large green spaces and restaurant service. Accommodation especially recommended for families or groups of friends who want to enjoy a privileged setting in the foothills of the Sierra de Guadarrama, 75 km from Madrid, Segovia 15km and 30 km from Ávila. Ortigosa del Monte belongs to National Park “Sierra de Guadarrama”, also to the recently named Biosphera Reserve “La Granja-Espinar”, and also included in Red Natura 2000, all of them networks of protected areas at European level. There are several figures of environmental protection for this area, such as: ZEPA (Area of Special Proteccion of Birds), LIC (Site of Community), PV (Valuable Landscape) and ASVE (Singular Area of Ecological Value) "REST AND RELAXATION" For guests who need to rest, we offer the possibility of a stay of retirement, enjoying the isolation and without taking the car. Just a 30 minute walk (1.5 km from the houses) you can stock up on local products at the shops of the village, either La Losa or Ortigosa del Monte: butchers, grocery, pharmacy, bakery, fish (Tuesdays and Thursday) and some pubs. We especially recommend the steak of the butchers, as this is an area of ranching tradition. In Las Casas del Palomar we offer complementary services to make your stay more enjoyable: cleaning, laundry, food at home (catering or roasted in a wood oven), babysitting, massage -osteopathy and chiropractic professional- pilates classes or yoga sessions. "ACTIVE TOURISM" The environment in Las Casas del Palomar invite to enjoy outdoor activities: the Cañada Real Soriana-Occidental, mountains like Peñalara, la Mujer Muerta, mountain passes like Guadarrama or La Fuenfría, even only the places around houses to perform various sports and active leisure. From Las Casas del Palomar we invite you to enjoy the possible routes for hiking, horseback riding or bike riding…even flying in a balloon or gliding! There are trekking routes and trails for beginners or expert mountaineers at different times of the year. We recommend getting information of the weather forecast before coming to properly so you can prepare the activities with success and security. We have route information in Las Casas del Palomar and also we can get you the contact of professional route guides and companies operating in the area. "CULINARY AND CULTURAL TOURISM" Culture and food, perfect symbiosis speaking of Segovia. This city must be walked to admire the beauty, let be carried away by its corners, counters, arches and alleys. The special light of Segovia with its colorful sunsets is spectacular panoramic sights as the Alcazar and the Aqueduct, or the view of the city from Zamarramala or La Veracruz. From Las Casas del Palomar you can plan the visit to the most important places in the area starting with the historical city of Segovia, The Palace of Riofrio and The Real Sitio de San Ildefonso, all of these just a few minutes driving away. Or a little further (30 to 50 minutes drive), Pedraza, Sepúlveda and Turégano. All of them good-looking and good-eating places. La casa es muy amplia y está muy bien equipada: amplio salón, habitaciones espaciosas, y al tener dos plantas, el piso de arriba estaba "colonizado" por los niños, mientras los mayores estábamos tranquilos en la planta baja. Hay que valorar también el espacio que hay alrededor de la casa, donde los críos han estado trotando y corriendo con toda tranquilidad. Desde el minuto 1 tuvimos muy buen feeling con Ana. La casa es mejor de lo que esperábamos. Tiene de todo. No le falta detalle. Una casa que enamora y desde que te instalas te sientes como en tu propio hogar. Ana nos ayudó en todo momento. Llegamos tarde y ella tuvo la amabilidad de recoger a mi hija y su novio que llegaban en autobús, también nos echó una mano para reservar un cordero y cochinillo poniéndonos en contacto con el carnicero y la panadera, que tengo que mencionar porque en La Losa la gente es encantadora. Una estancia de 10. Recomendable sin lugar a dudas.